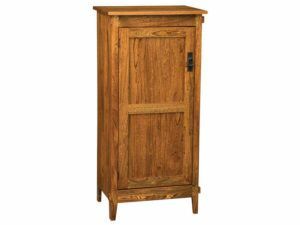 The Mission 2 Door Jelly Cupboard offers a rich finish and stylish storage. Brandenberry Amish Furniture’s collection of jelly cabinets is every jelly maker’s dream come true. Sure, they’re ideal for storing jellies. 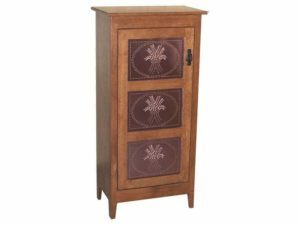 But you can also use your jelly cabinet for storing other items in your living room, bedroom, game room – or anywhere else in your home. Considering getting the jelly cabinet for your kitchen? 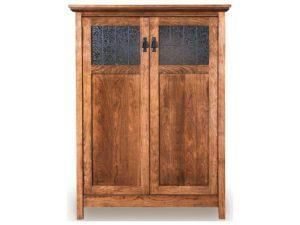 Then you may wish to order it with the decorative copper inlay door instead of the reverse raised panel door. The door comes with artistic renderings created by tiny ventilation holes. So the copper inlay doors look pretty cool as your freshly made items are cooled. And the kitchen fills with the aroma of your tasty treats. Amish artisans handcraft each piece. And they use hardwoods like maple, oak, cherry and hickory. So the cabinets are very well built. In fact, with proper care, the unit you choose should last for decades to come. 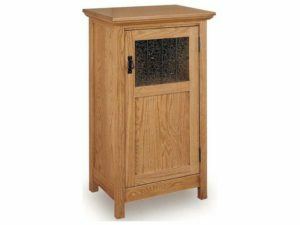 What’s more, you can order the cabinet as shown or unfinished. Or we can customize it to your preferences.